A number of international initiatives on climate change identify cooperation as one of the means to addressing the changing climate. Cooperation also applies in the context of climate change adaptation. As one of the global hotspots for disaster risk, it is imperative for Southeast Asia to build its climate resilience through climate change adaptation. While there are a wide range of interventions that can contribute to climate change adaptation efforts, technology plays a particularly important role across different sectors. This paper is the first part of a series of work that examine the different mechanisms of cooperation for climate change adaptation in Southeast Asia. 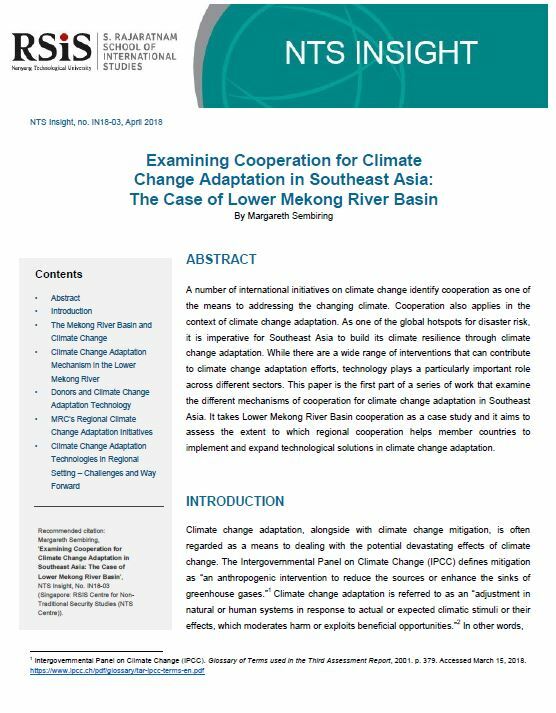 It takes Lower Mekong River Basin cooperation as a case study and it aims to assess the extent to which regional cooperation helps member countries to implement and expand technological solutions in climate change adaptation.